Normal difficulty. I don’t doubt it gets harder, just wasn’t very difficult yet. Only level 1 is a tutorial though. No new mechanics are added after level 1, nor does it tell you anything new. Or do you mean because it’s still easing you into it? Also I watched the video of level 11 before I bought it to see what game play looked like. Game strategy was only slightly different. There just isn’t enough to the game mechanics to change it up from level to level. Energy, mine, build laser/missiles. It’s not a bad game, just not very deep. So I completed Phantom Signal on Normal and despite doing the survival for the last 5 days straight, I’m still a few days away from getting all the research done. Today’s survival is pretty cool. I got the achievement for stockpiling 10,000 with so many rocks to mine. I lasted about 45 minutes. It’s a nice map. I wish you could save the seeds of these to do them again. But Survival seems to be broken from a leaderboard perspective - no names are appearing at all. I started up another game on hard this time around. If level 5 is any indication, it’s going to take many tries to get through these. This caught my eye recently, curious if anyone has thoughts on it? It’s apparently an action-rpg with tower defense elements, I noticed it’s coming out to the Switch as well. 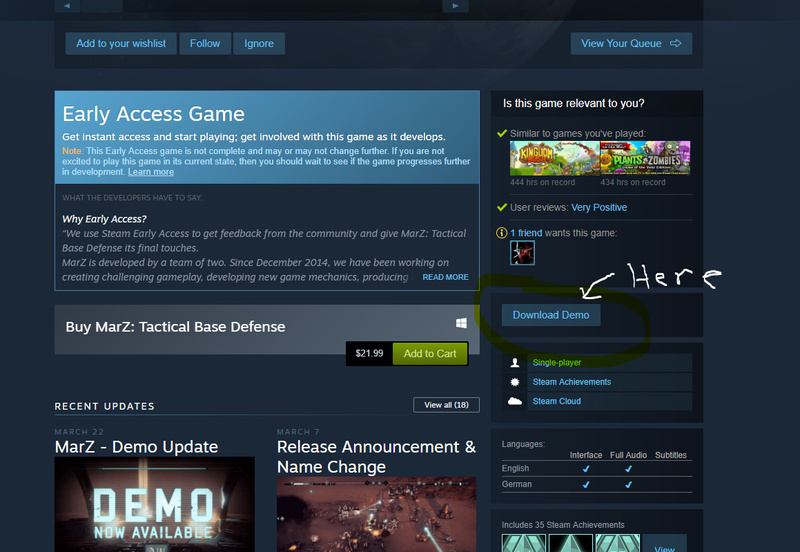 Saw this up on Steam, anyone bite? @BrianRubin report it, I see you have it! I see a download demo button. You could try it out too methinks. 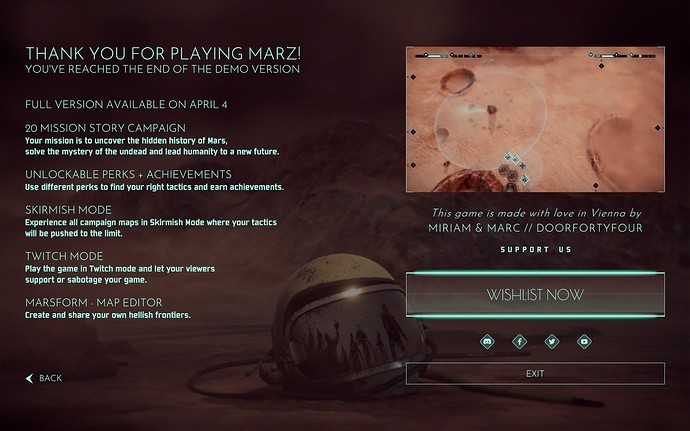 Early access, but scheduled for a full release on April 4th. Noted! I downloaded & tried the demo. It has 3 missions. Not sure if me or what, but I had to restart steam to get sound to work (weird thing was the sound for the video they play which highlights the features of the game works fine). The first 2 missions are the tutorial. The 3rd mission was very hard. Anywhoo, I don’t know. It’s an awfully twitchy game. 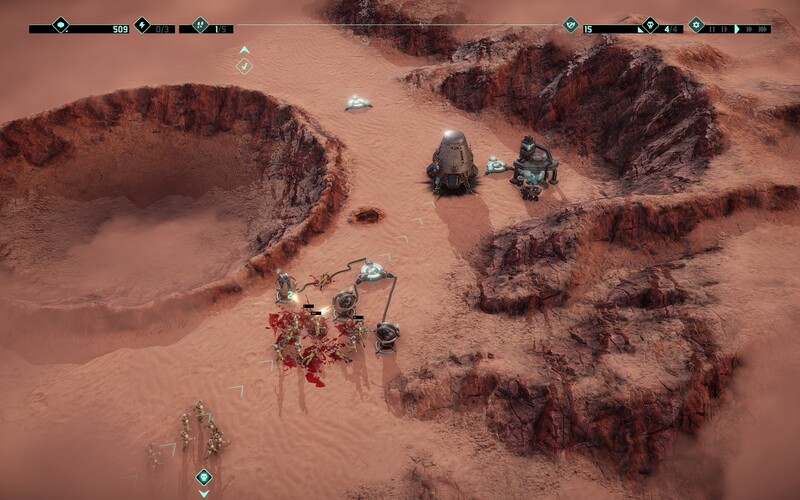 It has resource gathering and you have to build turrets but then you have to man both resources & the turrets with guys - which are in a very limited supply. 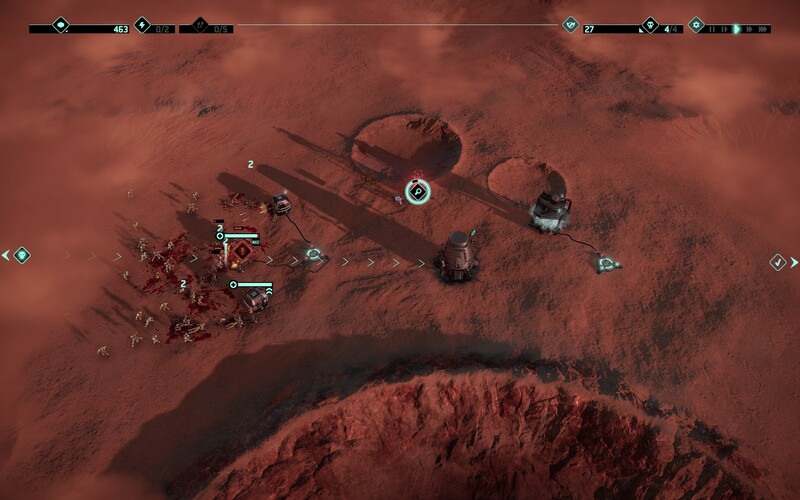 And they tell you in the tutorial “oh hey you can send guys out and they can fight outside of a turret”. Yeah, maybe for the tutorial (mission 2), but otherwise, don’t do that. They are way too squishy & getting reinforcements is basically game over. Moving guys between lander / turret / resources is very twitchy. Trying to time how long it will take them to hoof it over the martian landscape to the new thing you want them to man is busy work. The first two tutorial missions basically had only two paths they can come from, so bouncing back n forth wasn’t bad, but the 3rd mission has 4 paths. So you’re trying to decide when to build new turrets, move guys, request reinforcements (which by the way is a single dude - why have “s” on the end of reinforcement? ). It gets pretty chaotic. So props to them for having a nice demo. It’s very short but gets the point across, particularly on the 3rd mission, so I say download it & see if it’s your cup of tea. They do hide that pretty well for some games, it seems. Also the Stardock TD beta comes out in a week. Anyone a fan of the Stronghold series of games and have played the newer ones? The “hd” version of the original and crusader are both rated highly on Steam, but after than it really drops off. Did they mess with a winning formula? I’m just popping in to say thanks to whoever recommended Dungeon Warfare awhile back. I bought that because of your posts probably years ago, and finally got around to playing it last week. Fun game! Is there any info on the Stardock TD game? I saw that Brad had high hopes for it and that was the last I recall reading about it here. 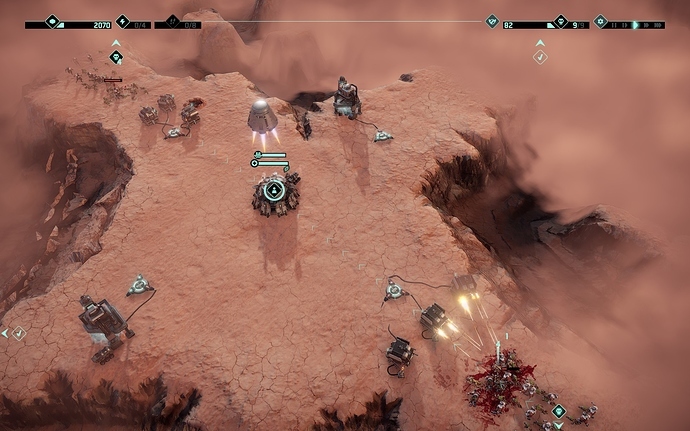 Stardock announced Siege of Centauri today, a new take on the tower defense genre that’s set in the Ashes of the Singularity universe. Early Access is coming soon! You can learn more about the game over on the forums. Founder’s Program launches on March 28. I just started it and will post back a bit later. i just bought it as well as the demo hooked me and I want more. It’s different & a bit more involved than your typical TD game, but I’m optimistic. Will report back later today. I finally tried the demo for MarZ , and its a nice mix of super light RTS meets Tower Defense. I might pick it up this weekend. I heard Mack’s voice when I was looking at the thanks for playing the demo screen. So I looked up and he did a WAB for this game. Looks like it was $10 during the early access , price doubled for full release. Humble Store has it for $15ish with discounts. I really wish they’d do an X-Morph sequel that cut out the “action” portion. The graphics, performance, and art design are incredible. So I have done two more levels in the campaign. It’s interesting the game gives you a “continue” option so you don’t have to do the first 3 levels again if you’ve done them with the demo. Level 4 introduces the research complex - many new weapons and you now can request 1,2 or 3 reinforcements (all at additional cost). Getting a perfect round so you get a new perk took me several tries on both 4 & 5. This is a hard game. A lot of juggling crew between one location & another and the crew are so darn squishy, hard to keep them alive. So for OCD people like me (and I suspect Effidian ;-) it’s going to take a bit to get through all the levels perfectly. I see a complaints on level 6 in the early access period. It’s the next level, we’ll see if I can get through it.